The other day my husband and I read the same email. I came away from it thinking it had a negative slant (I’ve discussed before the problems with email and their lack of tone) and wasn’t very happy with it. He on the other hand did not take it that way and when he read it back to me, I could see how he thought it was more positive than I did. (Usually he's the more conspiratorially driven in our household so this was new territory for us! )And that right there is why I find interpretation so fascinating. Because it is just that: a subjective interpretation by the interpreter, if you will. Now before I waffle on – as you know I can – I will specify that there are plenty of things that are not open to interpretation. The sky is blue (although someone who is colorblind or on LSD may beg to differ); two plus two is four; Hitler was a maniacal murderer (then again, I’m scared to say that may be open to interpretation by some). You get the idea. Fact is fact and most of the time there is no shade of grey when it comes to facts; unless they are spouted by a media outlet or a politician and then of course fact becomes…well an interpretation of the truth. See how fun this can be? 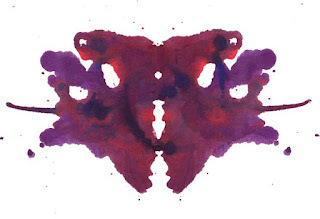 Anyway, the part I find so fascinating about interpretation is that when you look at many things in life (like the ink blot above: I see a Gummy Bear with wings; you? ), those things can turn into gray matter purely based on how many different ways they can be interpreted. And all these different angles, if you will, are based on the viewers vantage point, their baggage, their hopes, dreams, how much coffee they drank that morning. You get the idea. In essence, our interpretation of things says something about who we are. If someone reads something and wants it to be positive, it’s going to be. And conversely, if they see a rust coloured lining in everything, bet your bottom dollar they’ll find that too. I’m by nature a bit jaded. Hopeful, but jaded. It’s a funny, tedious mix I assure you. So most things I read or watch, I second guess, or think that somewhere deep down there may be an agenda. I know, painful right? The King often helps remedy this by being exactly what he seems. Gotta love children and their transparency. I suppose this is where my struggle with (organized) religion has always come in. Take the Bible for instance. Now there is a gigantic book that for most is open to interpretation. I mean you just have to read the thing to know that it was intended to be a guide and not an exact blueprint (my opinion of course). But there is a sect of Christianity of course that believes that the Bible should be taken word for literal word. Now, my problem is not with them per se (although innately I am not designed to think this way about anything); my problem is with the dichotomy of the two interpretations. Let’s be frank, it’s the size of the Atlantic Ocean and both interpretations cannot be right, can they? So that’s when interpretation becomes subjective and we happily leave it up to the individual. You see things your way; I’ll see them mine. And fact...well, that lies somewhere in the absurd middle. Life, never fails to amuse.